the innovative Speed Spin Active Reels of the unusual game, Lady of Egypt slots. 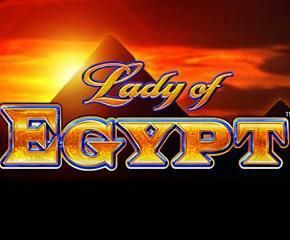 Scientific Games is the developer of Lady of Egypt slots game. They are a leading company in the regulated gaming and lottery industries. The company is known for developing content driven games with fascinating themes. Expanded Pays- When you land a symbol as a 3×3 block or if you see 2 or 3 symbols lined up as a mixed group which looks like the block then you are awarded the Extended pays. Any two or three of the higher value symbols forming the mixed group will get you 350 times your line bet. Medium paying icons forming the mixed group will get 200 times your line bet. The low paying icons forming the mixed group gets you 50 times your line bet. Speed Spin Active Reels- The first three reels are the Speed Spin Active Reels while rest of the reels are the secondary reels. In the event of a win, the secondary reels become active. Then the Active Reels shift two times towards the secondary reels. This happens every time you receive a win. You can get up to 5 times multiplier with these Active Reels. Reel 10 Multiplier Reward- You can get anywhere from 350x to 1,000x multiplier through the 10th reel at random. You see the multiplier at the centre of the 10th reel and if there is a winning spin then you get that multiplier. Free Games- Three scatters get you 8 free spins, four scatters grant you 10 times your stake apart from 12 free spins. Five scatter will award you 16 free spins along with 25 times your stake. 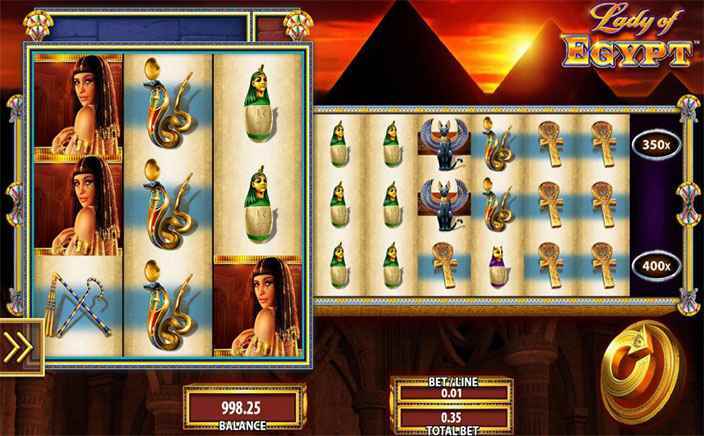 Lady of Egypt slots come with pretty different setup and features than the regular slots. The graphics of ancient Egyptian theme is intriguing and the soundtrack fits fantastically.